The national commander is the chief executive officer and official spokesman of The American Legion, with full power to enforce provisions of the organization’s constitution, bylaws and resolutions. Each national commander serves a one-year term, after which a new leader is elected at the national convention. Five national vice commanders who serve different regions are also elected at the national convention each year. 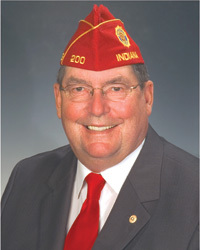 James E. Koutz of Boonville, Ind., was elected national commander of The American Legion on Aug. 30, 2012, during the organization's 94th National Convention in Indianapolis. Koutz entered the United States Army in August 1969. He attended basic training at Ft. Knox, Ky., and Advanced Infantry Training at Ft. Ord, Calif. In January 1970 he reported to Vietnam and served an extended tour of duty with Co. C 169th Engineer Battalion. He was honorably discharged with the rank of Specialist 5 in March 1971 and quickly joined The American Legion. He is a member of Boonville Post 200 where his father, George, was a World War II veteran and a past commander of the post. Jim was honored as a life member of his Post in 1991 and served as its post commander for nine years. Koutz retired from the Amax Coal Company in 1995 after 21 years of service. He was appointed by the Warrick County Commissioners in January 1995 as service officer for the Warrick County Veterans Affairs office. The governor of Indiana appointed him commissioner of the Department of Veterans Affairs in 2005 where he served as president of that commission in 2007. In January 2009 he was appointed to serve four more years. Koutz has held elected and appointed offices in The American Legion at the post, county, district, department and national levels. As Indiana State American Legion Commander, he achieved an all-time high membership during his tenure in 1990-1991. At the national level, he served on the Foreign Relations Commission and as chairman of both the Economics and Legislative Commissions. Additionally, he is a member of the Citizens Flag Alliance and also served on the Veterans’ Planning and Coordinating Committee. He was awarded the State of Indiana Council of the Sagamore of the Wabash in 1991 by former Gov. Evan Bayh and recognized for outstanding community achievement of Vietnam veterans by President Jimmy Carter. He received the Elks Distinguished Citizenship Award from the Grand Lodge of Order of the Elks and Boonville Elks Lodge No. 1180. The treasurer is custodian of the Legion’s funding. Duties include signing checks, making financial reports and performing other duties appropriate to the office. Buskirk, a major general in the National Guard, currently serves as legal counsel to the Chief of the National Guard Bureau, and served as adjutant general of the State of Indiana under Governor Frank O'Bannon from 2001-2004. He is a member of American Legion Frank McKinney Post 510 in Indianapolis. Buskirk, who joined the Guard in 1977, served in the U.S. Army Judge Advocate General Corps during the Vietnam War. He is a retired senior vice president and trust officer for Union Federal Savings Bank, and past president of the Indiana War Memorial Commission. The judge advocate advises national officers and the National Executive Committee on legal matters, including the interpretation of the national constitution and by-laws. Philip B. Onderdonk Jr. was appointed national judge advocate of The American Legion by then-National Commander Keith A. Kreul in 1983. Onderdonk, a member of American Legion Post 183 in Parkville, Md., served in the U.S. Army during the Vietnam War. He earned the Bronze Star as a contracting officer. A 1965 graduate of Johns Hopkins University, Onderdonk earned his law degree, with honors, from the University of Maryland Law School in 1969. He is a member of the Maryland Bar Association, the Indiana Bar Association, the Washington, D.C. bar association and the Pennsylvania Bar Association. He has been admitted to practice before the bar in all courts of Pennsylvania, Washington, D.C., Indiana and Maryland. He is also admitted to practice before the U.S. Supreme Court and the U.S. Circuit Court for the 2nd, 3rd, 4th, 7th, 9th, D.C. and federal circuits. Prior to his appointment as national judge advocate, Onderdonk was marketing and staff attorney for Crown Central Petroleum Corp. of Baltimore. His previous experience includes staff attorney for Mobil Oil Corp. in Philadelphia and Valley Forge, Pa., and law clerk for U.S. District Judge J. William Ditter Jr. of the Eastern District of Pennsylvania. Onderdonk and his wife, Ann, live in Carmel, Ind. They have two children. The historian is responsible for Legion history, and helps department and post historians coordinate, unify and promote their work. The national historian is assisted by the organization’s librarian and archivist. N. Larry Rozier of Raleigh, N.C., was appointed national historian of The American Legion on Aug. 30, during the 2012 National Convention. Ronald L. Derrick of Driggs, Idaho, was appointed national chaplain of The American Legion on Aug. 30, during the 2012 National Convention. An Army veteran, Derrick is a retired mail clerk and printer for Bonneville County, Idaho. He is a member of American Legion Post 95 in Driggs and served in the Army during the Vietnam War era. Derrick is an ordained elder at the Solid Rock Pentacostal Church. The sergeant-at-arms preserves order at national meetings and performs such other duties as may be assigned by the National Executive Committee or national officers. Alfonso “Al” Pulido of Griffith, Ind., was appointed national sergeant-at-arms of The American Legion on Aug. 30 during the 94th National Convention. Pulido is a member of American Legion Post 66 in Griffith, where he served as adjutant, vice commander, and commander. He has held the position of sergeant-at-arms for the Department of Indiana American Legion. At the national level, he was the national commander’s representative on the merchant marine committee. A certified master firefighter, state fire inspector and fire & arson investigator, he was the fire chief of the Lake Elian Fire Dept. from 1987 to 1990. He and his wife, Joyce, have four sons: Monte, Anthony, Matthew and Michael.